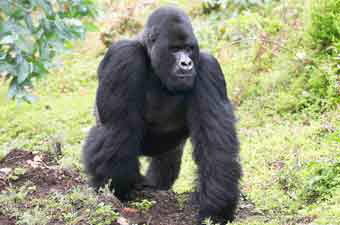 In a study published in the April 2011 issue of the journal Emerging Infectious Diseases, an international team of researchers report that a virus that causes respiratory disease in humans infected and contributed to the deaths of mountain gorillas in Virunga National Park in Africa. This finding raises questions about the safety of ecotourism for endangered species. The study was conducted by scientists at Columbia University's Center for Infection and Immunity (CII), Roche 454 Life Sciences, the UC Davis Wildlife Health Center, and the Mountain Gorilla Veterinary Project, a US-based non-profit organization. Mountain gorillas (Gorilla beringei beringei) live primarily in Rwanda, Uganda, and the Democratic Republic of Congo in Bwindi Impenetrable National Park and Virunga National Park, which houses about a third of the world's remaining gorilla population. Despite international efforts to protect this endangered species, there are currently fewer than 800 living mountain gorillas in the world. Now, this study, which focuses on an outbreak of respiratory disease in the Hirwa group of mountain gorillas in 2009, suggests that these animals may also be susceptible to human pathogens. Infectious diseases, especially respiratory ones, are the second leading cause of sudden deaths among mountain gorillas, after poaching. Growing ecotourism has increased interactions between humans and wild animals living in these parks, intensifying the chance for disease transmission. While ecotourism has heightened awareness of the need to safeguard endangered species, world travel also has the potential to quickly spread disease. Local authorities have recently tried to reduce animals' exposure to potentially harmful pathogens by limiting the number of tourists visiting wildlife parks and requiring visitors to wear protective masks. Despite these efforts, the frequency and severity of respiratory disease outbreaks among gorillas have been on the rise. In fact, of the 12 gorillas in the Hirwa group, 11 showed classic symptoms of respiratory infection, including coughing, runny nose, and lethargy. Two of these gorillas, an adult female and her male infant, died. Using state-of-the-art molecular methods, CII researchers found evidence of respiratory tract infection with human metapneumovirus (HMPV) and bacterial pneumonia in the female's lungs, throat, and nose. Further tests confirmed that HMPV found in the lungs of sick gorillas was closely related to strains circulating in South Africa, over 1,000 miles away, suggesting that tourists may have carried the virus into the parks. 'Pure' HMPV infections typically result only in mild damage to the respiratory system, suggesting that an interaction between HMPV and bacterial pneumonia may have been the cause of death. This observation is consistent with other studies that have shown that respiratory viruses like HMPV and H1N1, can make hosts more susceptible to opportunistic infections, like pneumonia. CII investigator and first author, Dr. Gustavo Palacios, stated, "we usually think of viruses as jumping from wildlife to humans, but what we often don't realize is that this is a two-way highway." "This study illustrates the importance of global commitment to the One Health Initiative," commented CII Director, Dr. W. Ian Lipkin. The One Health Initiative is a movement the aim of which is to promote collaboration among environmental, agricultural, veterinary, and human health sectors. Said Dr. Lipkin, "Conservation efforts must be expanded to protect wild animals from human pathogens to which they likely lack immunity."